'No Candy Store, No Pizza Shops, No Maxi-Skirts, No Makeup': Socializing Orthodox Jewish Girls Through Schooling." An account of the imposition of greater strictures on Bais Yaakov students in the 1970s. The Journal of the History of Childhood and Youth, Volume 9, Number 1, Winter 2016, pp. 140-158. "Sarah Schenirer and Innovative Change: The Myth and Facts." "The Troubling Trend of Photoshopping History." A description of the tendency to photoshop old photographs of Bais Yaakov to make them conform to more recent standards of modesty. "The Beit Ya'akov School in Krakow as an Encounter between East and West." Polin: Studies in Polish Jewry. Volume 23: Jews in Krakow. 2011. "Sarah Schenirer, Founder of the Beit Ya'akov Movement: Her Vision and Her Legacy." Brief introduction to the major developments of the movement in the interwar period, by a student and colleague of Judith Rosenbaum Grunfeld, an early instructor in the teacher training courses and Kraków seminary. Comprehensive history of the movement in interwar Poland, with a particular focus on the growth of the movement, legal and administrative challenges, and the curriculum in the supplemental schools and seminaries. PhD diss., Yeshiva University, 1959. "The Ninety Three Bais Yaakov Girls of Cracow: History or Typology?" Baumel, Judith Tydor and Jacob J. Schacter. in Reverence, Righteousness, and Rahmanut: Essays in Memory of Rabbi Dr. Leo Jung. "Beautiful Martyrs: The Last Will and Testament of the Ninety-Three Bais Yaakov Girls of Kraków (1942)"
An unpublished essay on the 93 Bais Yaakov girls. An overview of the school system that includes many eyewitness descriptions by the Agudah activist and journalist Joseph Friedenson, the son of the editor-in-chief of the Bais Yaakov Journal. In Hebrew. In Haḥinukh vehatarbut ha’ivrit be’eropah ben shete milḥamot ha’olam. Edited by Zevi Scharfstein, 61–82. New York: Ogen, 1957. Brief introduction to the school system with special attention to the full-day high schools in Łódź and Warsaw, including the new types of trade and business schools that opened in those cities. Kwartalnik Historii Żydów 1 (2012): 39–51. Toldot haḥinukh hatorati betkufah haḥadashah. A history of Orthodox education, with the last section (pp. 420–462) devoted to the Bais Yaakov schools, which are praised for rescuing Orthodoxy at a moment of great peril. Focuses in particular on the development of the movement in the Land of Israel and on its activities during the Holocaust. Bnei Brak, Israel: Or Haḥayyim, 1967. A brief description of the emergence of the movement, with a focus on its methods of legitimating Torah study for girls. Suggests that such efforts might serve as a model for contemporary feminists struggling with halakhic barriers to their intellectual and spiritual growth. In The Jewish Woman: New Perspectives. Edited by Elizabeth Koltun, 139–143. New York: Schocken, 1976. 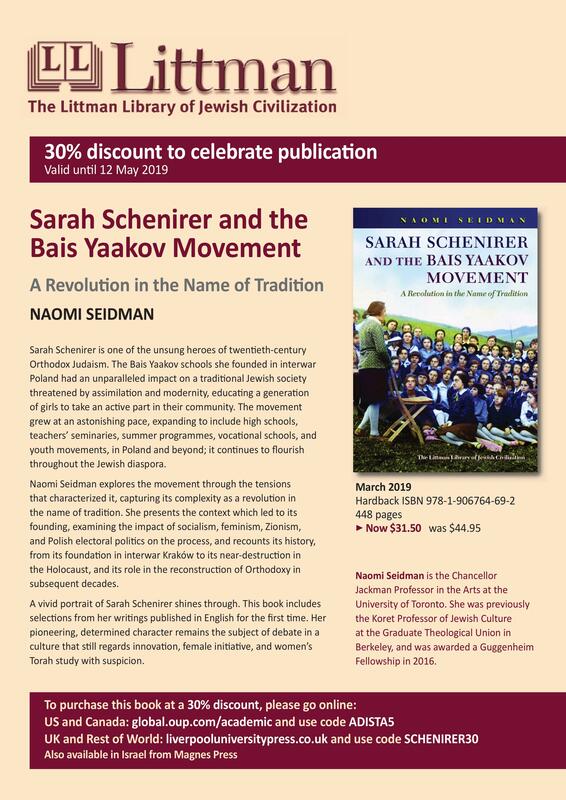 A comprehensive history of the movement, with sociological analysis of the interplay between tradition and modernity in Bais Yaakov. Suggests that the movement was effective in part because Bais Yaakov was a “total institution,” functioning as far more than a school system in the interwar period. MA diss., New York University, 1977. An encyclopedia article detailing the establishment and rapid growth of the movement, and suggesting that the movement was “proto-feminist,” although these tendencies were cut short by the Holocaust. Weissman, Deborah, and Lauren B. Granite. In Jewish Women: A Comprehensive Historical Encyclopedia. Edited by Paula E. Hyman and Dalia Ofer. Brookline, MA: Jewish Women’s Archive, 2009. The Littman Library of Jewish Civilization, in association with the Liverpool University Press. 2019. Discusses Sarah Schenirer and the Bais Yaakov movement in the context of increasing attempts to draw youth and girls into the Hasidic experienceKraków. in Jewish Spirituality and Divine Law (2005), pp. 407-454.
essay in Joining the Sisterhood : Young Jewish Women Write Their Lives, SUNY Press, 2003. A crowd-sourced blog of stories from contemporary Bais Yaakov girls.